Last Summer, I decided to run for Los Angeles City Council, in the 13th district, a place I have lived in for 41 years, a place where I have been a community activist, organizer and leader for over two decades. As the candidate who had lived the longest in the district, armed with creative approaches to community issues and city government, it was my dream to be the City Hall representative for the place I call home. However, in early December, that particular dream came to an end as I failed to collect enough signatures to make the March 5, 2013 primary election ballot. I spent the next two months away from my community, and sought solace in California’s Eastern Sierras and Mt. Shasta areas, places I had never been to previously that gave me the comfort of natural beauty, peace, quiet, strength and healing. It was a much-needed break; I have been involved in some sort of community activity, meeting or event every month since March, 2003 – a streak of an antire decade. I recently returned to “my world” and found the Council District 13 race in full gear. I thought about who I would want to endorse, or at the very least, vote for. One of the reasons why I ran was because I was unsatisfied with the cadre of candidates at the time. So many of them had carpetbagged their way into our community just for mere political opportunity, and not so much because they understand issues like litter/blight, lack of responsiveness and poor communication from City government, and an overall lack of awareness, education and participation by its residents with regards to community issues. After my political miscarriage in early December, I was bombarded with calls, emails and Facebook messages from the other candidates, like sharks ready to feast on the carcass of the Fail Whale. As a candidate, I had unique insight into the campaign. I had met many of the candidates on the campaign trail, I learned more about them as people (both positively and negatively). I observed how they interacted (or didn’t interact). I heard the rumors and hearsay. Some of them were nice, classy people. Some of them were total jerks. Ultimately, there were twelve on the ballot. Some I despise. Some I could tolerate. Some I admired as people but didn’t think they had what it takes to be our next councilmember. I wanted to make the right decision, not a pressured decision. I didn’t want to just settle for the proverbial Lesser Of Twelve Evils. But one candidate stood out to me as genuine, accessible, trustworthy, experienced, a good listener, and most of all, possessed a true understanding of the issues in the 13th District. 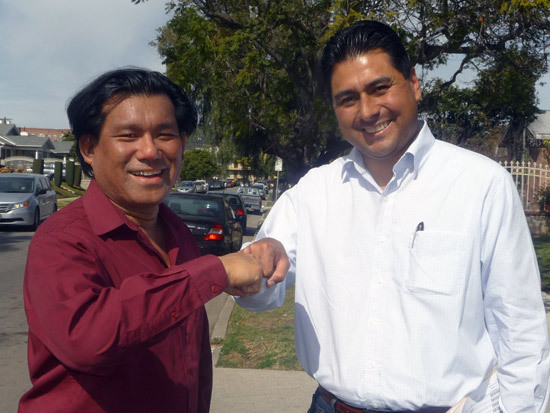 Today, I am proud to announce my wholehearted endorsement and support for Robert Negrete for Los Angeles City Council. Robert and I have many things in common — we are both lifelong products of Council District 13; and with me out of the race, it is now he who has lived in the district the longest. Like me, the Atwater Village native lives in and loves the community he was raised in. We both ran for the same reasons – to be a local advocate for our communities who truly knows its quality-of-life issues. We both experienced violent crime first-hand in the district: I was mugged at gunpoint in 2001; he witnessed a murder on his own front yard in 2004. We also went to high school together. We both attended and graduated from John Marshall High School in 1989; I as a senior, he as a sophomore. We both come from immigrant families who have lived in the district since the 1960s. And we are both singers/musicians and avid bicyclists. As locals, not surprisingly, we have several mutual friends. But Robert also possesses 16 years’ experience in local government (which I admittedly lack), working as a staffer and an aide in previous Mayor’s and City Counclmembers’ offices, and most recently for State Senator Alex Padilla. I had a nice meeting with him last week where we talked about community and shared our common gripes with City government. I didn’t feel compromised, I didn’t feel like I was being pitched to, and his appeal for my support and endorsement was genuine. I wasted no time in my support: this past Saturday Robert and some of his volunteers walked East Hollywood. I gladly took him around my block, introduced him to all my neighbors and instantly got their support. My block is solidly rocking the Negrete blue signs! I would like to address one thing though: With three candidates on the ballot of Asian heritage, some of you might be wondering why I, as an Asian American/Filipino American Angeleno, am not backing any of them. The reason is simple: All three are new to the district and have moved here solely to run for this office. As someone who has been fighting for stop signs, paved roads, safer neighborhoods, organized community cleanups, planted half a dozen trees, initiated a native plant garden, started a community improvement association and successfully founded a neighborhood council and brought many people together over the course of the past two decades, I cannot allow an uninitiated person with opportunist motives, who hasn’t paid their dues, and most of all who hasn’t done anything for our community. to have my vote, support and endorsement, no matter who they are. This is not about “crab mentality” or being a “hater.” This is all about integrity. Council District 13 is where Mike Woo made history as the first Asian American to serve on the L.A. City Council. Twenty years since he was termed out, there has yet to be someone to follow in his footsteps. Yes that does concern me, but the Asian/Pacific Islander community deserves people of true integrity and substance to be representatives — not just of our ethnic group, but for all constituents. Quality should always supersede quantity. Maybe I will continue that legacy one day. Or maybe another generation will get to do that. When the right Asian American elected officials in Los Angeles come along, who run for the right reasons, I will surely be the first to show support. I have no qualms about supporting a Latino of Mexican American heritage for the CD13 seat. Demographically, they deserve to have another one of their own in City Hall. But Negrete, born and raised in the 13th District had the same multicultural upbringing I had, and most importantly, he is the best out of the dozen to bring the diverse people of our district together. To all my friends and one-time supporters, I urge you to vote with me on March 5th to elect Robert Negrete as our next city councilmember. A local, trustworthy and experienced voice who deserves to be our voice in City Hall. Let’s Rock This – Together! For more information on Robert and his campaign, please visit his website at negrete4council.com, or follow him on Facebook and Twitter. All three are new to the district and have moved here solely to run for this office..” Alex De Ocampo was born and raised in CD 13. He briefly moved away when he commuted to college and moved back into Los Feliz/Atwater before rezoning. Then he moved back to CD 13 with his stroke-victim mother. You need to retract and correct your statement. Shame on you for typing up incorrect information. Alex previously lived in Mt. Washington. He told me himself last Spring he was moving into the district to run. There is nothing incorrect with my statement.